Puri is known for its Jagannath Temple & Rath Jatra. Due to the religious nature of the heritage town, numerous rituals & cultural practices are prevalent in Puri. Some are known to outsiders while many are yet to come to limelight, some of which are grand in nature. 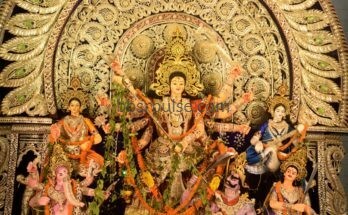 One such is the beautiful and colourful Durga Puja celebration under the name ‘Gosani Jatra’, the term which is quite mystic. 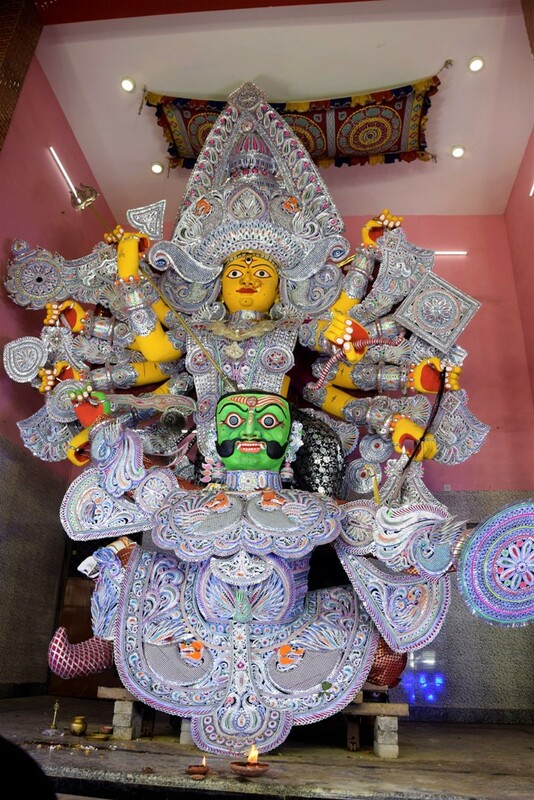 Under Gosani Puja festival of Puri, several big clay idols of Mahisamardini Durga are worshipped every year in the month of Ashwina (October). Here the clay idols are made by using chikita mati (clay), gobara (cowdung) & nadaa (paddy straw). 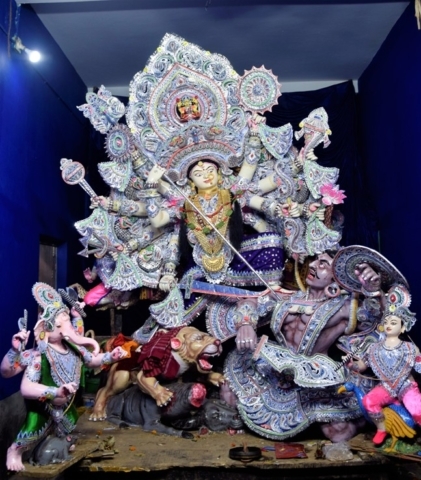 It is to note that, this ‘Gosani Yatra’ is indigenous to the city of Puri, since no outer influence could be noticed, be it in clay model, decoration, colour application, postures, ornamentation & even in the names of Gosanis. 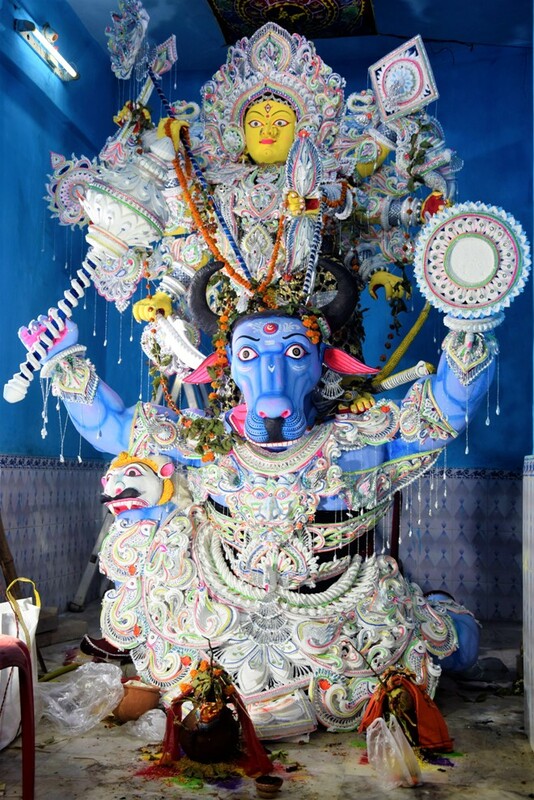 The artists use primary colours like hingula, sankha, geru and lamp black for colouring the deity. Gosani mostly looks yellowish & light while demons look greenish or bluish. Unlike other Durga clay idols, the Gosani looks quite fiery with her eyes gazing downwards at the buffalo demon Mahisasura. She is seen pulling his hair with her hands, strangulating him with a serpent and piercing him with her trident, while kicking him in the chest, influenced by Mahisamardini sculptures found on the temple walls., specially the theriomorphic form of the demon. Strangely her vahan is not so in combat mood. Interestingly, the demon, in most cases, is depicted in theriomorphic (buffalo headed human) form & while some in anthropomorphic (having human characteristics). 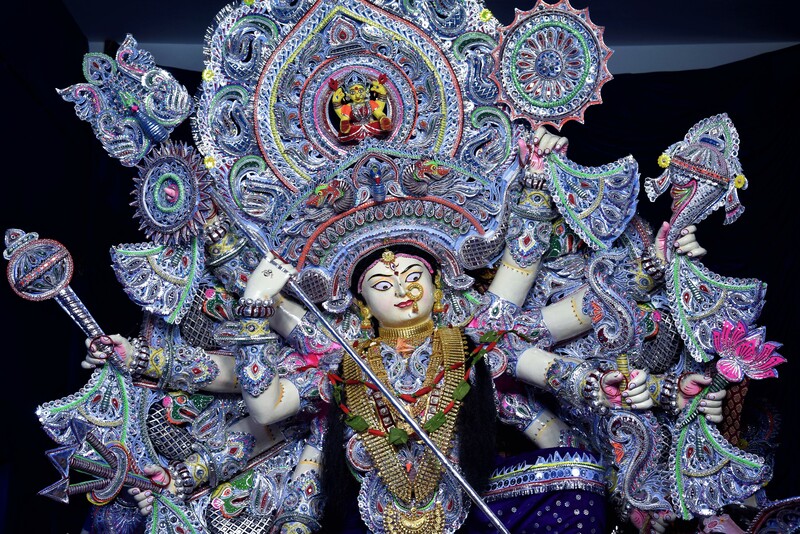 The decoration of these Gosani Images is also different from Durga Idols of other localities. Originally, the crown, ornaments, attributes and the halo are being decorated with traditional Sola and Jari work. Like Gosani, gigantic images of Naga (from Puri’s Sahi akhada culture), symbolising heroism & valour, are also made and worshipped during the festival. The worship of images of Gosani (associated with Shiva) in Puri was initiated by the first Ganga King Chodagangadeva of Ganga dynasty in 11th century, who began the ritual of Shakti puja following instructions of a tantric guru Nitei Dhobini. He also initiated the building of the current Jagannath Temple at Puri. 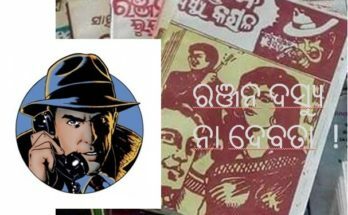 The word ‘Gosani’ is said to be derived from the Oriya word ‘Gosamani’, which means ‘aristocratic lady’, the wife of the owner (Goswami) , the brahmin lord (Gosein in Odia) or the paternal grand mother (Gosein Maa). In royal families of Odisha, the princess are called ‘Jemamani’. In this way the paternal great grandmother is called ‘Gosamani’. 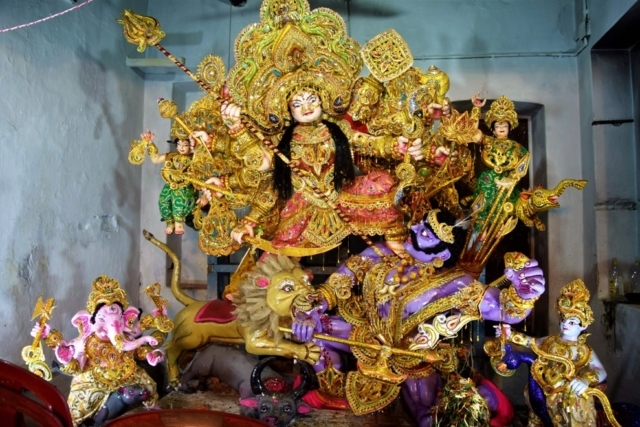 The local people believes the Gosanis as the saviour and nourisher of their locality and therefore, during Durga Puja festival they use to worship Gosani images in their respective Sahis (Street). The Gosanis represent several aspects of Mahisamardini Durga at Puri and worshipped during the Durga Puja festival. Every Gosani has a particular name to indicate her individuality & belonging to a Sahi (lane), yet with some repeated names like Janhikhai, Harachandi etc. They are rather crude & local, suggesting their connection to local tribes and villages and with their folk culture. Kakudikhai (she who eats cucumbers), Janhikhai (she who eats ridge gourd). Sunya Gosani fights the buffalo-demon in the sky. The Kantakadhi (thorn-removing) Banadurga stands with one raised leg. Details of some of the popular Gosani deities are mentioned below . Please click on any image here to view the images in gallery. 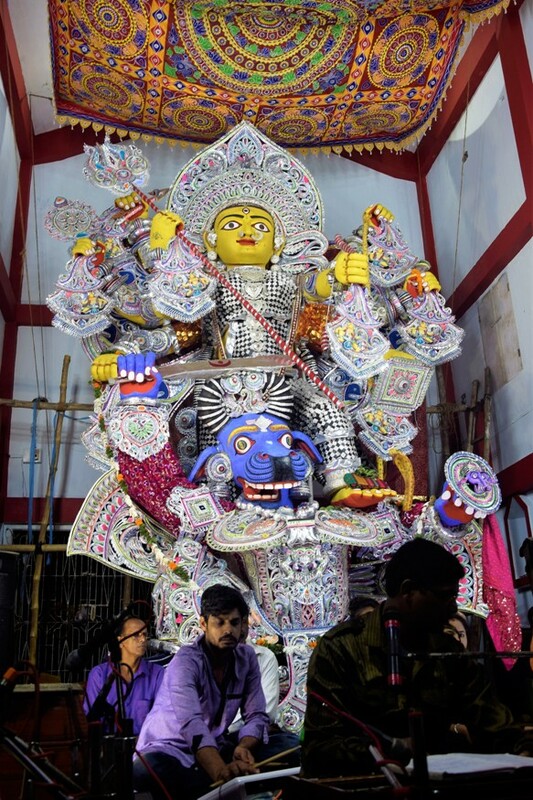 Barabati Gosani:- She is the biggest Mahisamardini figure made during Gosani Jatra festival in Puri. 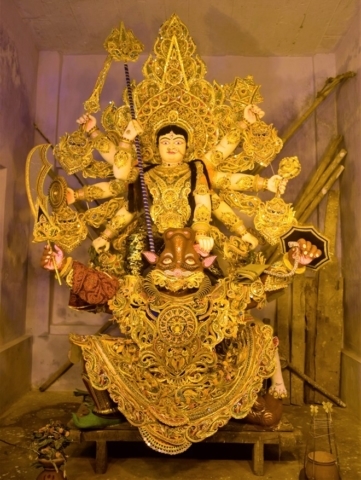 She is regarded as the second Gosani among the local people. 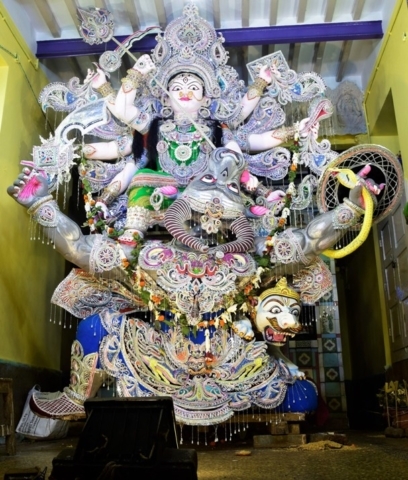 This idol is built annually by the initiative of the members of the Barabati Jaga (akhada) and therefore, the Gosani is so named. The height of this gigantic Gosani is around 20-22 feet in height. She has eight arms and displays snake, conch, dagger, bow, arrow, sword and trident. The demon Mahisasura is depicted in the theriomorphic form. As per iconography, Barabati Gosani is older than the Kakudikhai Gosani, hence referred as elder sister. 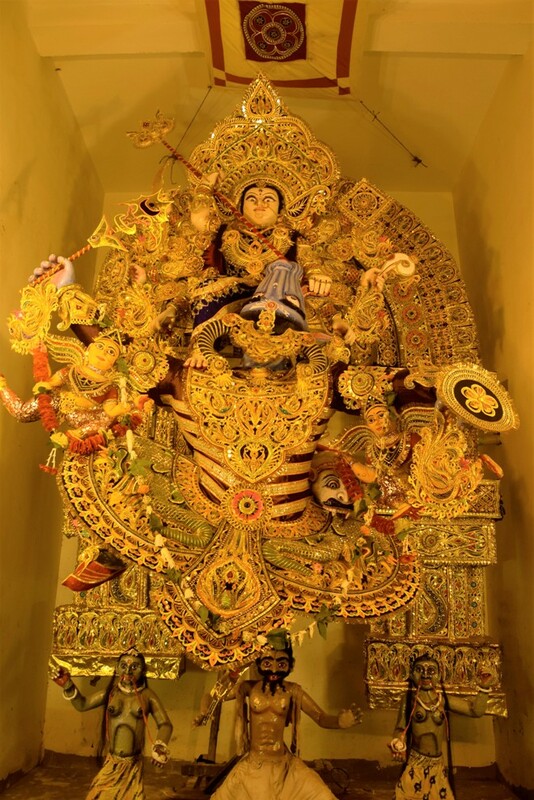 Kakudikhai Gosani:- She is regarded as the chief among the Gosanis of Puri and worshipped at Baniapati in Balisahi & is regarded as the representative of goddess Vimala outside Srimandira. As the name suggests, she is fond of cucumber. Earlier, the custom of animal sacrifice was prevalent which was later on replaced with a symbolic sacrifice of vegetables like cucumber, ridge gourd etc. 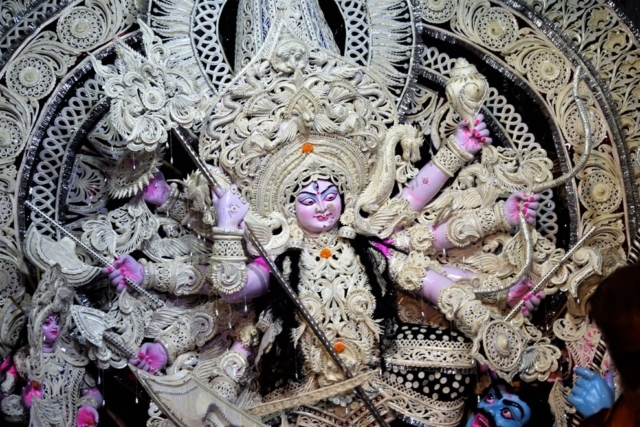 This custom is even now extinct, but still Devi carries the name. Here devi is ten-handed and holds shield, conch, bow, snake and the hairs of Mahisasura in her left hands while she holds trident, sword, wheel, arrow and goad. Here the goddess places her left foot on the shoulder of Mahisasura and right foot on her vahana, the lion. She is seen accompanied by goddess Saraswati, Laxmi, Ganesha and Kartikeya. The Kakudikhai idol is immersed on the Dusherra night while the other idols are immersed one day later. 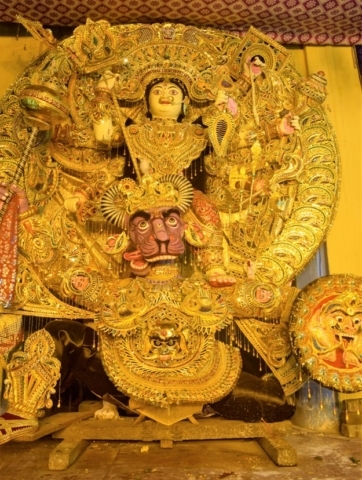 Janhikhai Gosani:- There are four places at Puri associated with asharmas named after rishis such as Angira Ashrama, Bhrugu/Parashar Ashrama, Pandu Ashrama & Markandeya Ashrama. Near these four ashramas, there are mandapas where Gosani images are made annually. 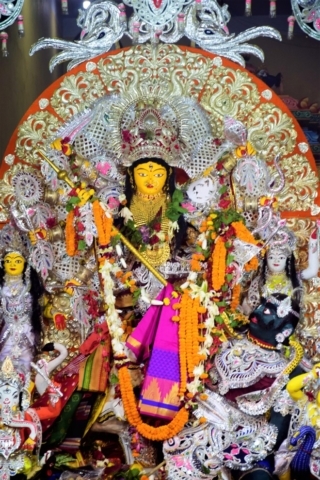 It is noteworthy that, they are all known as ‘Janhikhai’ (ridge gourd loving Durga) except the Gosani at Dolamandapa Sahi (near Agira Ashrama) who is known as ‘Janhimundia’. The image of ‘Janhimundia’ is the second biggest in Puri after Barabati Gosani. The height of her image is average 16 feet 16 inches. The mandapa roof’s height has been modified at least once to accommodate her huge size. Here, the goddess has ten hands and holds shield, conch, bow, snake, trident, sword, goad, wheel & arrow. The demon here is depicted in complete human form instead of a buffalo. 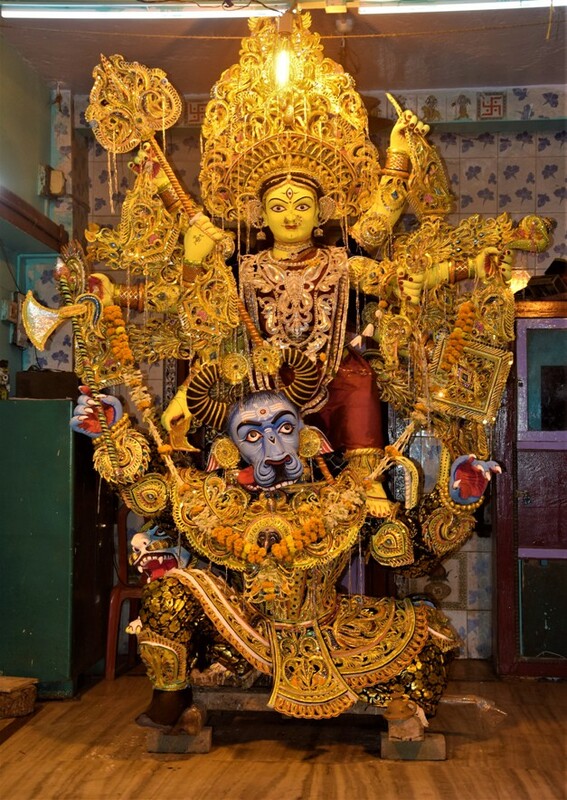 Kantakadhi Gosani (Banadurga):- The image of Kantakadhi Gosani (thorn removing) is a peculiar one, as she is standing in one feet. The other one is bent and Lord Vishnu is depicted removing the thorn from this bent foot of the Devi, depicting respect for feminity. On the other side Lord Siva is seen standing & smiling. She is well known in the texts as ‘Banadurga’ (Durga of the Forests). Its the only Gosani where the Mahisasura is absent. The very image symbolises the peaceful co-existence of Shaktism, Vaishnavism and Shaivism. Sunya Gosani:- This interesting & quite rare posture of Sunya Gosani displays the war between goddess Durga and Mahisasura in the sky. She is virtually seen hanging in air without any support & her image was much bigger during older days than the present size. 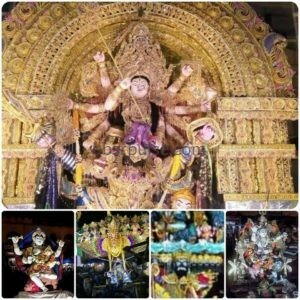 Here Devi has eight arms & displays snake, conch, dagger, bow, arrow, sword and trident. On the lower portion of this Gosani image hills, forests and wild animals can be seen, which presents the bird’s eye view of the earth surface from the sky. Bhogajaga Gosani:- During the rule of the Bhoi King Gajapati Ramachandra Dev, a mandapa was built for the offerings to the moving deities of Srimandira. ‘Bhoga’ meaning offering & Jaga means the ancient gymnasium’s plot allotted by Kings to servitors & public to prepare a local army to protect the temple from possible external attacks. The ‘Akhada’ near this mandapa is known as ‘Bhoga Jaga Akhada’ due to this. 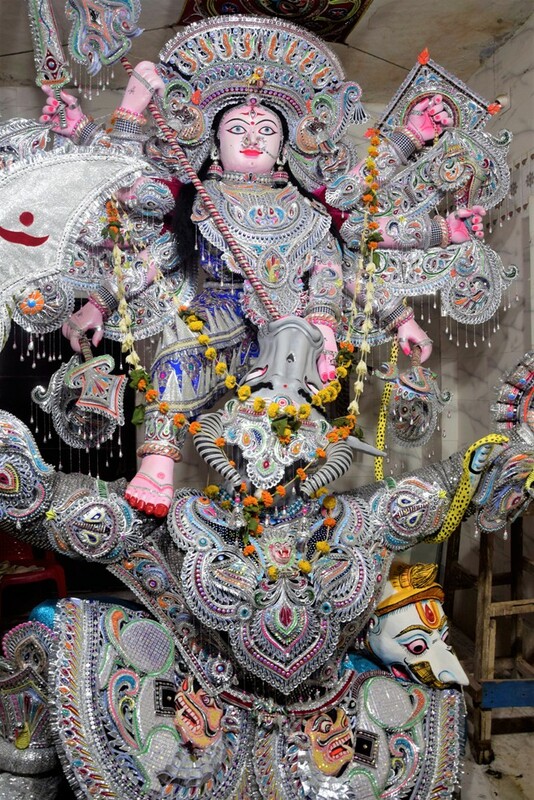 The name of the Gosani of this Jaga is also known as ‘Bhogajaga Gosani’ who is regarded as the third Gosani. The height of this image is ten feet. 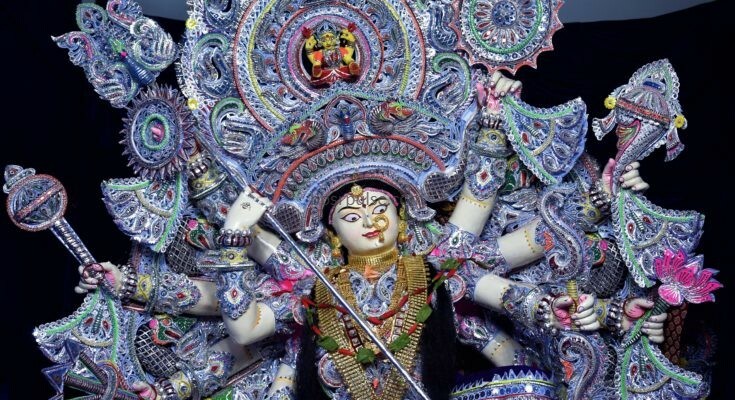 The goddess has eight hands & displays snake, conch, dagger, bow, arrow, sword and trident. Like Barabati Gosani, here the demon is depicted in the theomorphic form. This image is famous for its traditional style and fine decorations in sola. The other Gosani idols under Gosani Jatra includes Hadabai, Gelhabai, Belabai, Harapriya, Chakrakota, Chameda (Tripura Sundari), Harachandi (from three sahis), Mahateswari, Moda Mahisha, Pana Priya, Sitaleswari, Jama Kota Thakurani etc. The Gosani images are more or less influenced by Mahisamardini sculptures found on the temple walls of Kalinga especially during Bhaumakaras (7th-9th cent). For eg. 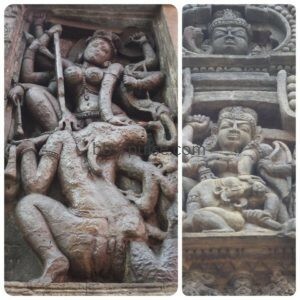 If one compares the Mahisamardini images of Vaitala Deula and Parashurameswar Temple at Bhubaneswar, one can clearly see the similarity between the Gosanis vs demons as depicted in clay idols with that of stone sculptures here. In both the case, the demon is seen completely overpowered by the goddess. All the pandals in Puri are not Gosani related, rather those with particular pattern and traditional names are Gosanis and limited to specific sahis near Sri Mandir & there is no new additions to it. 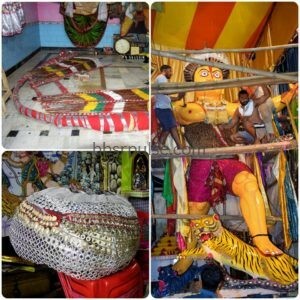 Naga:– Apart from the usual Gosani idols, certain other idols & characters are also worshipped including Naga (the wrestling warrior akin to Puri akhadas), Sampati bird (Jatayu’s brother), Rabana etc. The Naga’s face consists of big round eyes, sharp nose, curly moustache and beard. A beautiful heavy handia (headgear) adorns his head & on the top of this headgear, a lotus flower of sola can be noticed. The Nagas, beside worshipping, also practised body building and wrestling in these akharas. To commemorate this old tradition, huge figures of Nagas are used to be made in different places of Puri (especially in ‘Akhadas’). 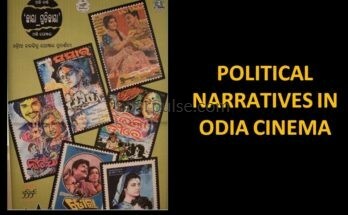 Even its depicted in Puri’s famous Sahi Jata (street folk play) where Rabana plays the pivotal role. 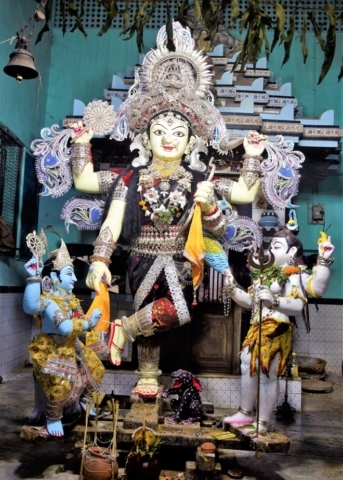 Among the Naga figures, the Naga of Bali Sahi and Harachandi Sahi are older, bigger and more famous in Puri’s local culture. Also, there are two Nagas – one on the West Gate & another on Grand Road as if guarding the temple, apart from couple of smaller Nagas in various sahis nearby. 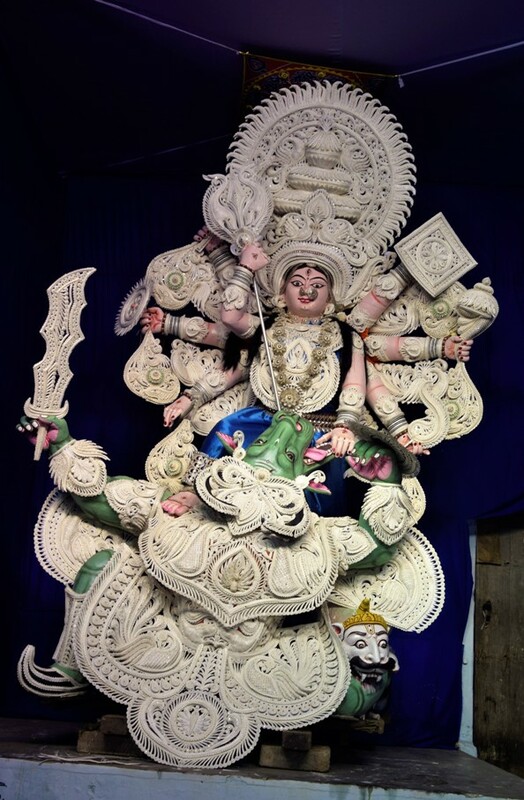 These type of huge clay images of Naga are indigenous to Puri and not seen anywhere. The huge figure of Naga (near about twenty feet) resembles a human standing in the manner of a hero with a well built body. 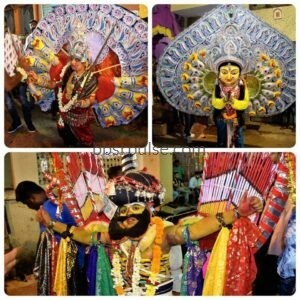 His attire is associated with the ‘Nagarjuna Vesa’ of Lord Jagannath. His weapon includes mashal (torch), shield, dagger, knife and interestingly, a gun too. On the back of the figure, a tatti (bamboo mat) can be seen tied to his body. 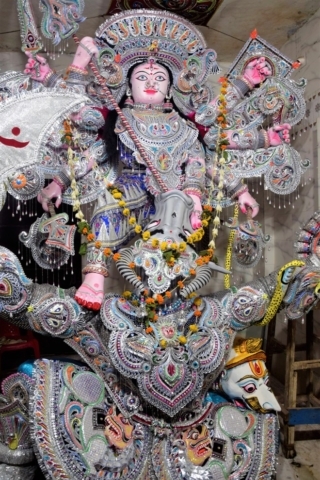 The Sahis associated with Gosani are Harachandi Sahi (most popular with Gosanis), Mati Mandapa Sahi, Gaudabada Sahi, Tiadi Sahi, Gudia Sahi, Dola Mandapa Sahi, Karati Sahi, Kalika Sahi, Baseli Sahi, Manikarnika Sahi, Sitala Pinda Sahi, Markanda Sahi, Chandan Hazuri Sahi, Mahasuar Sahi etc. And, the mandapas where theriomorphic form of the demons are depicted includes Barabati, Chandan Hazuri, Jamakota, Moda Manisha, Pana Priya, Chakrakota, Harachandi from Harachandi Sahi/Mahasuar/Karati Sahi, Mahateswari, Belabai, Gelhabai, Hadabai, Bhogakhai, Shunya Gosani, Sitaleswari etc. Likewise, those mandapas where the demon is depicted in human form includes Kakudikhai, Janhimundia, Janhikhai of Gaudabada/Markanda/Bali Sahi, Chameda etc. In most of the places, Gosanis are related to public, hence sarbajanina, having local names in different streets & even some names have repeated like Janhikhai & Harachandi (various devis with same name). Like the Gosanis in mandapas, the public procession for immersion in the nearby rivers, called ‘bhasani jatra’ carried on the very next after the Bijaya Dashami Day is equally captivating with the Gosanis adored with additional tableaux which increases their overall beauty. Thing to note here that Gosani Jatra tradition is being carried out since 11th century which reflects a strong folk culture in its fullest form. Sadly. till now, Gosani Jatra is relatively lesser known to the rest of India and tourists. 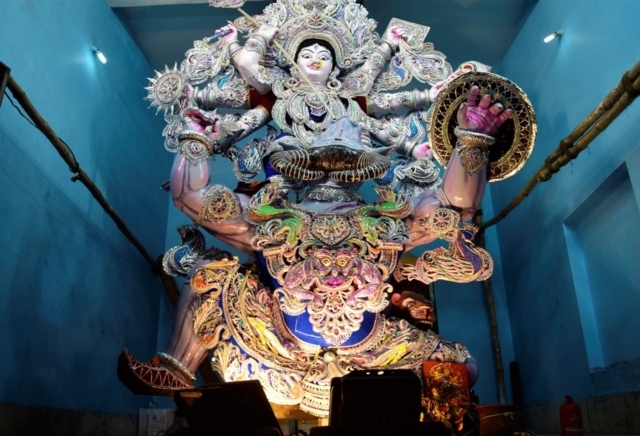 Its high time for Govt of Odisha especially its Tourism Dept to bring it forward into national arena & popularize it on pan India basis since no such Durga Puja can beat the traditional yet grand Gosani Jatra in whole of India.